This property was sold by Janice Baker. For similar results, feel free to contact Janice at 843-540-9096. Welcome home to Palm Key - A 350 acre Island located along the Broad River between Beaufort, SC and Savannah, GA. 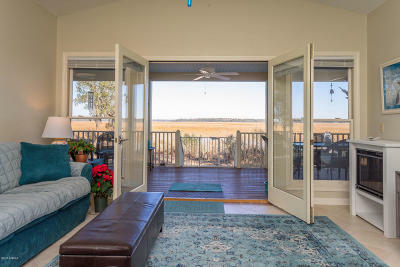 This is a perfect opportunity for an investor(short term rental), retiree, or family who wants to enjoy all the nature that the Lowcountry has to offer. Palm Key is a nature lovers paradise. On any day you can witness, Egrets, Herons and Eagles soaring over the marsh. At night, the sky is star filled.You can Kayak, fish or walk the trails. This home has undergone many upgrades in the last 12 months. New ceramic tile baths, new ceramic tile flooring in both bedrooms, new bottom freezer refrigerator, extended front porch - Too many improvements to list. See full list in Document section. Don't miss out on this opportunity .Furnishings can be bought with few exceptions.